When Elderly Are Hospitalized, Families Face Tough Decisions : Shots - Health News Some people might find it easier to write down the care they want and the kind they prefer not to have in living wills. Others might prefer to talk more generally with their relatives about issues like life support. 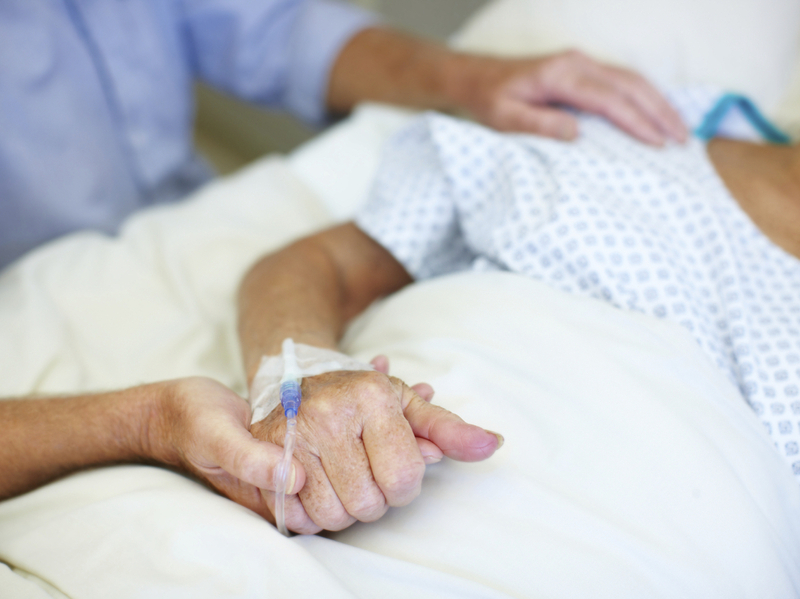 Who will help make decisions when an older family member is hospitalized? It's never easy making medical choices for family members who are too sick to speak for themselves. But researchers say families of the elderly should be ready to do so. When people over 65 end up in the hospital, about half of them eventually need someone else in the family to make decisions for them, according to findings published in the latest issue of JAMA Internal Medicine. "This has been a growing concern for medicine in the last generation," says lead researcher Dr. Alexia Torke, who teaches medicine at Indiana University and serves as a researcher for Regenstrief Institute, a biomedical research center. "Ever since the advent of intensive care, we've had growing abilities to keep people alive even when they were so sick that they could no longer communicate," Torke tells Shots. And that means family members often have to step in and make difficult calls. Torke says she was surprised at how widespread this experience is. "I wasn't sure going into the study whether these cases were just memorable because they're so difficult to deal, with or whether they really were very common," she says. In Torke's study, the decisions that family members had to make ranged from routine to life-or-death. The research team looked at patients admitted to two hospitals in the Midwest over a study period that lasted a little more than three years. Fifty-seven percent of the families in the study had to decide things like whether or not their loved ones should receive CPR or be hooked up to a ventilator if their lungs stopped working. Family members also had to approve medical procedures and decide what to do once someone was discharged from the hospital. Those common situations can be unsettling. "In recent years, there have been studies that showed that family members experience an extreme amount of distress when they have to make decisions for their family members, including, for example, symptoms of post-traumatic stress disorder and depression and anxiety," Torke says. There are some caveats to keep in mind. For one, researchers gathered some of their data by interviewing doctors about the patients they treated, rather than asking the patients themselves. But Torke says this study underscores the need for families to discuss these issues before anyone ends up in the hospital. "It's important to have conversations with older adults about the kinds of treatment they would want if they're unable to make decisions for themselves," she says. Some people might find it easier to write down specifically what they want in living wills, while others might prefer to talk more generally about issues like life support. Hospitals could also do a better job of helping families feel comfortable making decisions on behalf of their loved ones, Torke says. Doctors could make sure family members are present when they update patients on their medical status, or they could send families updates over the phone. "Given the important role that family members play," Torke says, "they should be regarded as an integral part of the medical team."